Your day-by-day itinerary now includes Natural Bridge. 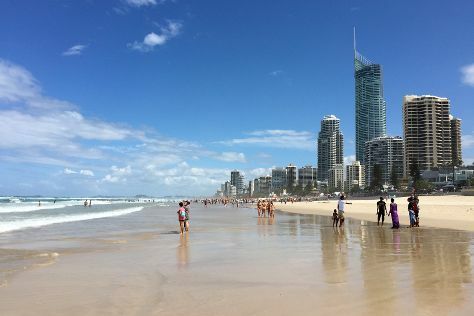 Step out of the city life by going to Coolangatta Beach and Surfers Paradise Beach. Your inner history buff will appreciate Nepalese Pagoda and Cape Byron Lighthouse. Get out of town with these interesting Gold Coast side-trips: Brisbane (Lone Pine Koala Sanctuary & South Bank Parklands). It doesn't end there: enjoy the sand and surf at Burleigh Heads Beach. For traveler tips, other places to visit, photos, and more tourist information, you can read our Gold Coast vacation planning app . Expect a daytime high around 30°C in April, and nighttime lows around 19°C. Wrap up your sightseeing on the 28th (Sun) to allow time to travel back home.